fDepartment of Radiology (J.H. ), Rikshospitalet, Oslo, Norway. 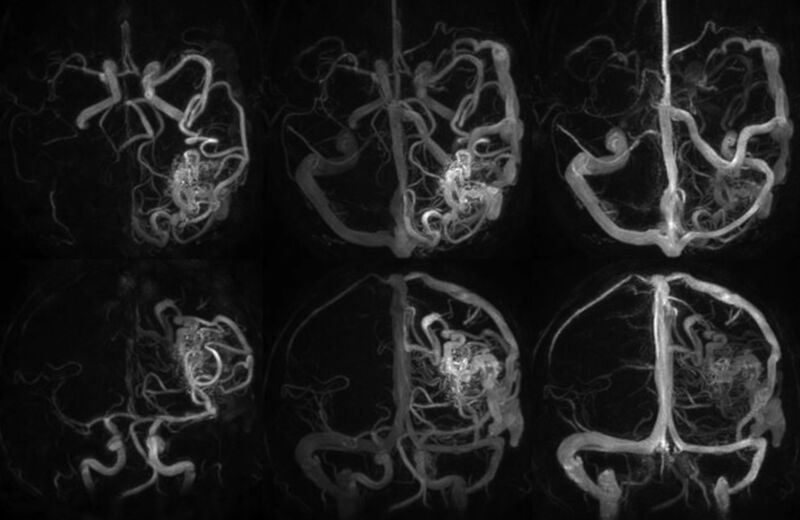 BACKGROUND AND PURPOSE: HYPRFlow is a novel imaging strategy that provides fast, high-resolution contrast-enhanced time-resolved images and measurement of the velocity of the entire cerebrovascular system. Our hypothesis was that the images obtained with this strategy are of adequate diagnostic image quality to delineate the major components of AVMs. 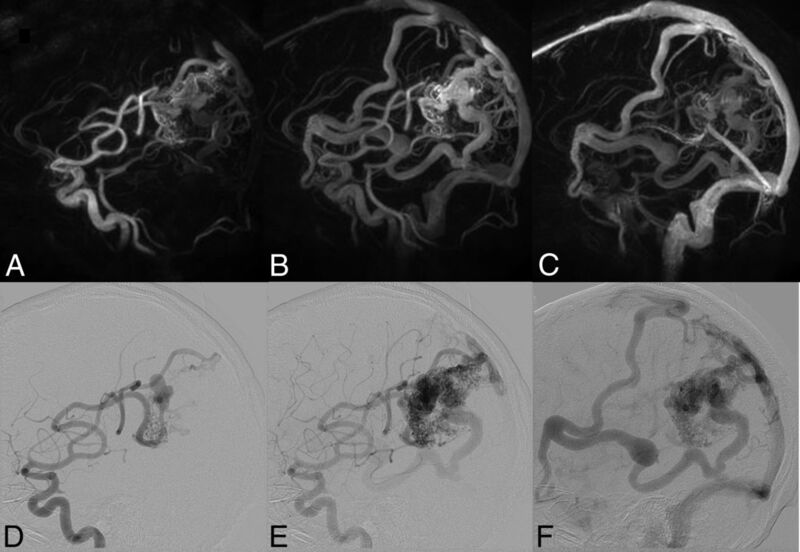 MATERIALS AND METHODS: HYPRFlow and 3D TOF scans were obtained in 21 patients with AVMs with correlative DSA examinations in 14 patients. The examinations were scored for image quality and graded by using the Spetzler-Martin criteria. Mean arterial transit time and overlap integrals were calculated from the dynamic image data. Volume flow rates in normal arteries and AVM feeding arteries were measured from the phase contrast data. RESULTS: HYPRFlow was equivalent to 3D-TOF in delineating normal arterial anatomy, arterial feeders, and nidus size and was concordant with DSA for AVM grading and venous drainage in 13 of the 14 examinations. Mean arterial transit time on the AVM side was 0.49 seconds, and on the normal contralateral side, 2.53 seconds with P < .001. Across all 21 subjects, the mean arterial volume flow rate in the M1 segment ipsilateral to the AVM was 4.07 ± 3.04 mL/s; on the contralateral M1 segment, it was 2.09 ± 0.64 mL/s. The mean volume flow rate in the largest feeding artery to the AVM was 3.86 ± 2.74 mL/s. CONCLUSIONS: HYPRFlow provides an alternative approach to the MRA evaluation of AVMs, with the advantages of increased coverage, 0.75-second temporal resolution, 0.68-mm isotropic spatial resolution, and quantitative measurement of flow in 6 minutes. Volunteer patient studies were performed in compliance with the Health Insurance Portability and Accountability Act regulations and by using a protocol approved by the local institutional review board. Subjects were recruited from patients undergoing clinical assessment for known brain arteriovenous malformations. Twenty-one adult subjects (14 women, 7 men) ranging from 27 to 69 years of age were imaged by using a 3T MR imaging system (Discovery 750; GE Healthcare, Milwaukee, Wisconsin) with an 8-channel head coil (HD Brain Coil; GE Healthcare). A key element of HYPRFlow is the use of undersampled 3D radial trajectories to speed the acquisition (3D radial readout = vastly undersampled isotropic projection reconstruction [VIPR]). Radial imaging eliminates the time-consuming phase-encoding used in Cartesian acquisitions. Acceptable radial images can be generated from substantially fewer readouts than conventional Cartesian encoding, providing whole-brain imaging in a fraction of the imaging time. However, as the number of radial trajectories decreases, undersampling artifacts become apparent in the images. The undersampling artifacts can be removed or dramatically reduced by the constraining process. Fast serial 3D radial scans are obtained of the entire brain during the passage of a contrast agent by using only a small number of readouts. This dynamic acquisition is termed CE-VIPR (contract-enhanced time resolved vastly undersampled isotropic radial projection reconstruction). Very fast temporal resolution can be achieved providing a whole-head 3D acquisition every 0.5 seconds. High-resolution phase-contrast vastly undersampled radial projection reconstruction (PC-VIPR) angiograms and velocity measurements are acquired by using a 5-point flow-encoding strategy that increases the velocity-to-noise ratio.14 The phase-contrast angiograms are well-suited for highly constrained projection and local reconstruction (HYPR LR) because the stationary background tissue is subtracted out and the remaining vascular structures are sparse in the imaging volume. HYPRFlow image reconstruction. Top row: 60 whole-brain 3D radial scans are obtained every 0.5 seconds and reconstructed by using a 0.75-second acquisition window during the first passage of the contrast bolus. Four scans are displayed from this time-series (3D CE-VIPR timeframes). Top right: following the dynamic scan, a 3D radial phase-contrast MRA is obtained (5-minute PC-VIPR MRA used as the vascular constraint). Middle row: temporal weighting images are produced by using a low-pass filter. 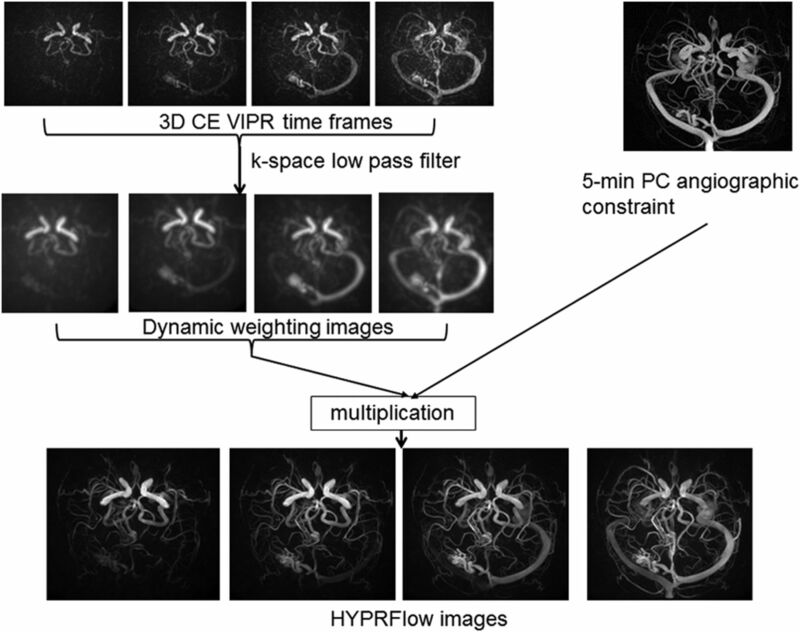 Bottom row: HYPR LR multiplication and reconstruction are performed by using the phase-contrast angiographic data to constrain the dynamic weighting images. Four HYPRFlow images from the 60-image time-series are displayed, demonstrating improved SNR and spatial resolution following HYPR LR reconstruction. By including both a dynamic series for the display of contrast kinetics and a phase-contrast acquisition to measure flow features, we anticipated that this strategy would be useful for the evaluation of high-flow conditions such as brain arteriovenous malformations. Our primary hypothesis is that the images obtained with this novel strategy are of adequate diagnostic quality to delineate the major components of AVMs. Imaging parameters for the dynamic contrast-enhanced multiecho 3D radial scan (CE-VIPR) were the following: FOV = 22 × 22 × 22 cm3, TR/TE = 3.0/0.4 ms, bandwidth = 125 kHz, 64 points from the center to the edge of the k-space for each projection, frame rate = 0.5 seconds, spatial resolution = 1.7 × 1.7 × 1.7 mm. Gadobenate dimeglumine (MultiHance; Bracco Diagnostics, Princeton, New Jersey) was injected at 3 mL/s, and the contrast dose was 0.1 mL/kg followed by a 20-mL saline flush. Scanning parameters for postcontrast PC-VIPR were the following: FOV = 22 cm3, TR/TE = 8.1/2.8 ms, velocity encoding = 80 cm/s, bandwidth = 62.5 kHz. The readout matrix was 320 points per projection, and the spatial resolution for the phase-contrast study was 0.68 mm3. Seven thousand radial projections were acquired within approximately 5 minutes. For comparison of spatial resolution, 3D TOF examinations were obtained by using 4–5 overlapping slabs (TR/TE = 25/2.5 ms, FOV = 24 cm, Cartesian encoding, zero-filling, voxel size = 0.5-mm isotropic). 3D-TOF was included to allow comparison of the arterial anatomy with the highest resolution MRA method commercially available. The DSA studies were obtained within 8 weeks of the HYPRFlow scans by using an Artis zee biplane system (Siemens, Erlangen, Germany) with multiple projections, supplemented by 3D imaging and microcatheter-selective injections using imaging frame rates of 4–8 frames per second. DSA was considered the criterion standard for analysis. HYPRFlow arterial and venous phase images and TOF images and DSA arterial and venous phase images were scored by 2 experienced neuroradiologists (with >25 years in practice) for image quality in the M2/M3 branches for all 3 modalities. Deep and superficial venous image quality was also scored for HYPRFlow and DSA. Quantitative measurement of the separation of arteries and veins for the time-resolved contrast-enhanced HYPRFlow images was assessed by generating contrast time curves obtained from the proximal middle cerebral artery and the vein of Trolard (or an analogous large cortical vein) ipsilateral and contralateral to the AVM. The overlap integral was calculated as the area of the overlapped region between arterial and venous contrast kinetic curves. The description of this approach for the evaluation of time-resolved contrast-enhanced MRA has been previously reported.19,20 A smaller overlap integral implies better arterial and venous separation. The overlap integrals were compared by using a 2-sample t test. In addition, mean arterial transit time was measured in the middle cerebral artery and the vein of Trolard (contralateral to the AVM) and the main feeding artery trunk (A1, M1, P1) and the earliest filling cortical vein (ipsilateral to the AVM). The flow analysis of the PC-VIPR velocity data was performed by using a commercial software program (EnSight; CEI, Apex, North Carolina). Volume flow rates were measured in the proximal middle cerebral artery (ipsilateral and contralateral to the AVM) and the largest arterial feeder to the AVM. Image quality values for HYPRFlow were compared with both TOF and DSA. TOF was also directly compared with DSA by using the Wilcoxon rank sum test. A P value < .05 was considered a significant difference between modalities. Maximum nidus diameter was measured for all 3 modalities, and the Wilcoxon rank sum test was used to compare the results. When we compared M2/M3 arterial branches, there was no significant difference between the mean image quality scores of HYPRFlow (3.18) and TOF (3.26) (P > .05), but there were very significant differences between the image quality of both HYPRFlow and TOF compared with DSA (3.94) with P < .002 and .004, respectively. DSA deep and superficial venous image quality (3.82) was significantly better than HYPRFlow (3.08) (P < .005) (Figs 2⇓–4). Right temporal lobe AVM. Top row: 3 HYPRFlow images from the 60-image dynamic series. Arterial (A), mixed (B), and venous phase (C) images are displayed. Bottom row: corresponding DSA arterial (D), mixed (E), and venous phase (F) images. 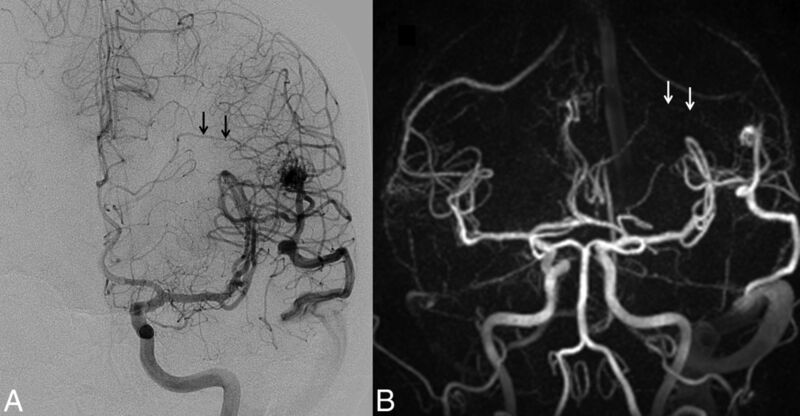 The HYPRFlow images demonstrate the cortical venous drainage similar to the DSA. HYPRFlow images of a left parietal occipital AVM, demonstrating whole-brain coverage and isotropic 0.68-mm resolution. Top row: axial HYPRFlow MIP images left to right: arterial, mixed, and venous phase. Bottom row: the same image data projected into the coronal plane, left to right: arterial, mixed, and venous phase images. The same patient as shown in Fig 3. Top row: HYPRFlow images in the sagittal plane: arterial (A), mixed (B), and venous phase (C). Bottom row: corresponding DSA images: arterial (D), mixed (E), and venous phase (F). Note the excellent correlation of the arterial supply and venous drainage pattern. Differences in the maximum diameter of the nidus were not significant between HYPRFlow (mean diameter, 32.4 mm) and DSA (mean diameter, 34.3 mm) (Wilcoxon rank sum test, P = .11). However, there was a statistically significant difference (P = .016) when TOF (mean diameter, 30.2 mm) was compared with DSA. The Spetzler-Martin grades and number of patients in each category based on DSA were grade I (n = 2), grade II (n = 4), grade III (n = 3), grade IV (n = 3), and grade V (n = 2) (Figs 2⇑–4). There was 1 instance in which very small deep medullary draining veins were not identified on the HYPRFlow examination, resulting in disagreement with the DSA Spetzler-Martin grade (Fig 5); otherwise HYPRFlow and DSA were in concordance. Left posterior frontal AVM. A, The DSA examination demonstrates a small deep medullary vein (arrows), which drains into the straight sinus. 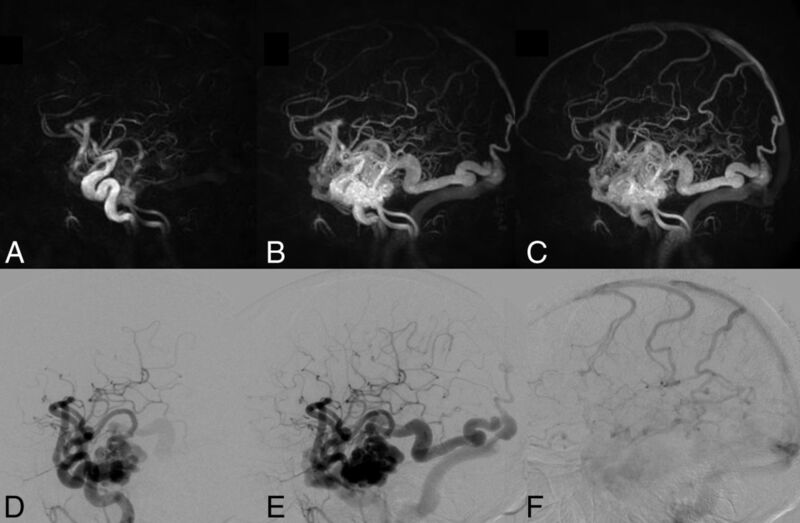 The AVM nidus was in close proximity to the Broca area and was scored as Spetzler-Martin grade III. B, Coronal HYPRFlow late arterial phase image with poor delineation of the deep medullary vein (arrows), resulting in incorrect classification of the AVM as Spetzler-Martin grade II. A 2-sample t test revealed a significant difference between the mean arterial transit time on the AVM side (0.49 seconds) compared with the normal contralateral side (2.53 seconds) with P < .001. A 2-sample t test revealed a significant difference between the overlap integral of the AVM (0.92) compared with the normal side (0.82) with P < .001. The mean arterial volume flow rate in the M1 ipsilateral to the AVM across all subjects was 4.07 ± 3.04 mL/s, the contralateral mean arterial volume flow rate was 2.09 ± 0.64 mL/s, and the mean volume flow rate measured in the largest feeding artery to the AVM was 3.86 ± 2.74 mL/s. While this study demonstrates that HYPRFlow is well-suited to assess AVMs, there are still multiple challenges. Patient motion may result in misregistration of the dynamic and static scans, resulting in image blurring after constrained reconstruction. Undersampling artifacts may also be a concern; however, the artifacts are limited by the sparsity of neurovascular structures in the imaging volume and the location of the artifacts predominantly outside the ROI. The sample size of patients is small, limiting generalization of the findings. The flow analysis was limited to major arterial structures, and no hemodynamic measurements were made of the venous components. There may also be vascular signal loss in the PC-VIPR data due to spin-dephasing from complex flow. The impact of hemosiderin and other blood products on the image quality of the HYPRFlow images was not systematically reviewed. However, signal loss due to blood products would fall under the general class of artifacts related to susceptibility phase dispersion and subsequent signal loss. Susceptibility-based signal loss was a major aspect of our analysis. The short TE of the PC-VIPR sequence reduces but does not eliminate signal loss due to susceptibility effects. Another limitation is the challenge related to detecting aneurysms within and remote from the nidus. Previous reports have shown that aneurysms can be accurately identified when a portion of the signal from the contrast-enhanced magnitude dataset (the contrast-enhanced 3D radial T1-weighted component of the phase-contrast acquisition) is combined with the flow images.38 However, this approach was not used in this investigation due to the large size of the datasets and the lack of automated processing tools. Consequently, systematic analysis of aneurysm detection was not performed. The velocity dependence of PC-VIPR may result in loss of signal in very slow-flow structures, though this is reduced by the use of contrast enhancement and 5-point flow encoding and can be overcome by including a component of the magnitude data in the reconstruction.38 Finally, reconstruction by using HYPRFlow takes 30–45 minutes and requires noncommercial software. This study demonstrates that HYPRFlow compares favorably with 3D-TOF for the evaluation of arterial feeders and AVM nidus size. There was no significant difference in the measurement of the maximum diameter of the nidus between HYPRFlow and DSA, and there was only 1 discrepancy in assessing venous drainage. HYPRFlow provides a more comprehensive evaluation of AVMs, delineating the arterial supply, nidus size, and venous drainage and offers contrast kinetics and hemodynamic information. Disclosures: Kevin Johnson—RELATED: Grant: National Institutes of Health*; UNRELATED: Patents (planned, pending or issued): US patent pending, Comments: Contrast-Enhanced MRA with Highly Constrained Backprojection Reconstruction Using Phase Contrast Composite Image, US Patent No. 7991452. Under our agreements, I may be entitled to a portion of the licensing fees if this technology were put into a commercial product; Royalties: US Patent Royalties; Other: research support from GE Healthcare. * Pauline Roca—RELATED: Grant: GE Healthcare,* Comments: I had a postdoctoral position funded by GE Healthcare from June 1, 2011, to May 31, 2013. Beverly Aagaard-Kienitz—RELATED: Grant: GE Healthcare,* Comments: GE Healthcare provides support to the University of Wisconsin MR imaging research program. The investigators do not receive any direct funding. Charles Mistretta—RELATED: Grant: National Institutes of Health*; Support for Travel to Meetings for the Study or Other Purposes: National Institutes of Health*; UNRELATED: Grants/Grants Pending: National Institutes of Health, Comments: 4D DSA and 4D fluoroscopy; Payment for Lectures (including service on Speakers Bureaus): various universities, Comments: typical visiting professor lectures; Patents (planned, pending or issued): I have several recent patents related to x-ray work; Royalties: Wisconsin Alumni Research Foundation, Comments: royalties on several MR imaging patents. Patrick Turski—RELATED: Grant: National Institutes of Health RO1 NS066982,* Comments: National Institutes of Health RO1 NS066982 provides support for development of accelerated MRA techniques; UNRELATED: Other: GE Healthcare,* Comments: GE Healthcare provides support to the University of Wisconsin MR imaging research program. The investigators do not receive any direct funding. *Money paid to the institution. This work was supported by the National Institutes of Health RO1 NS066982. Paper previously presented in part at: Annual Meeting of the American Society of Neuroradiology and the Foundation of the ASNR Symposium, April 21–26, 2012; New York, New York. Accepted after revision September 29, 2014.